Family caregivers now have a tool which allows their disabled loved ones to stay home longer, avoiding nursing homes or assisted living and “Age in Place”. 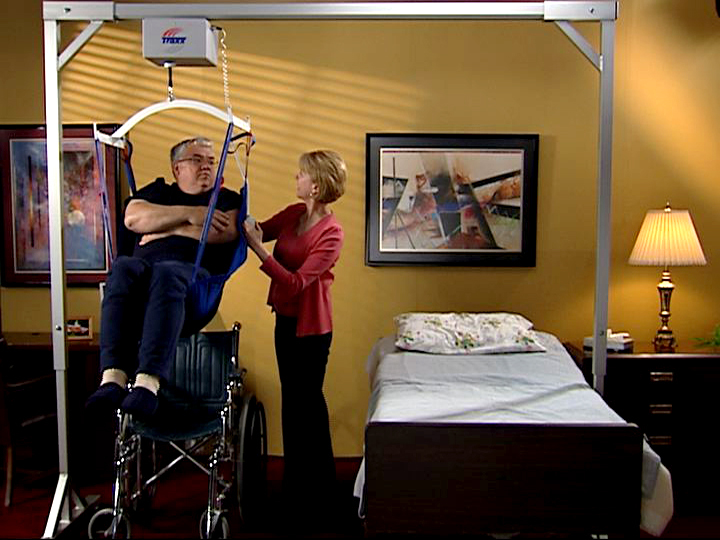 The Titan 500 is a freestanding overhead patient lift designed for home care and the family caregiver. It allows a single caregiver to safely transfer their loved one from bed to chair in a comfortable and dignified manner. An overhead lift provides a more secure and stable transfer experience for both the patient and the caregiver. Lifting from above reduces the risk of tip-over associated with floor-based lifts as well as removing the strain placed on the caregiver to move the lift with the patient still in it. The challenges of home care, like furniture and carpeting, present the caregiver with even more stress, both physical and mental. An overhead lift also puts the caregiver in close proximity to the patient during the entire transfer, providing both physical and mental support during the lift. Ideally, an overhead track can be installed in any location, or even connected to run throughout the home. Unfortunately, these types of systems are very costly and require extensive installation and home modification. A freestanding overhead patient lift, like the Titan 500, is an ideal solution for those who cannot or choose not to modify their home in this manner. The lift does not attach to the structure in any way, provides a sturdy, wide base for lifting, and works above and around the bedroom furniture to stay out of the way but always ready to go. 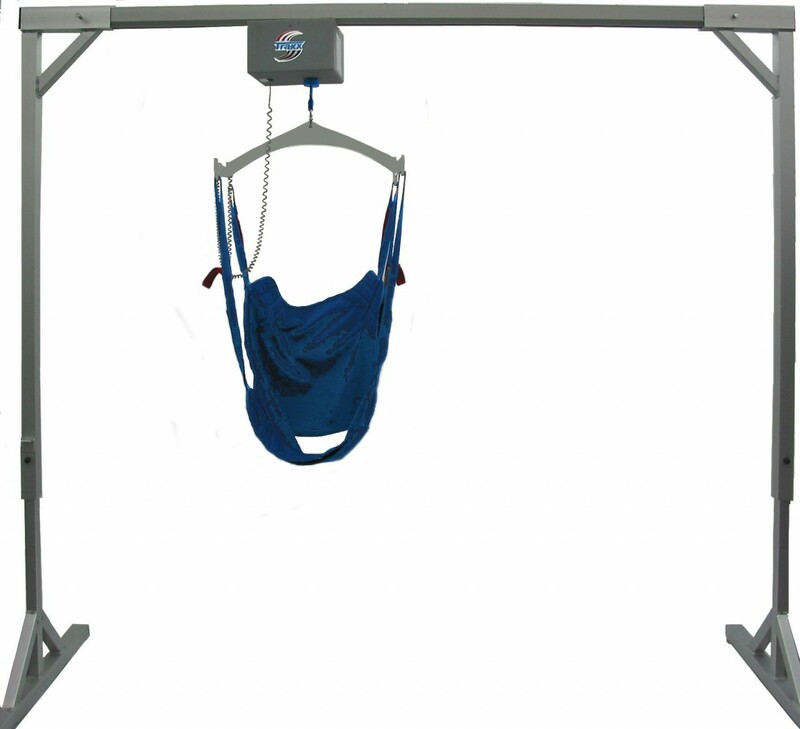 The Titan 500 freestanding overhead patient lift allows a single caregiver, often a spouse or offspring, to operate the lift and transfer their loved one without any outside help. A simple remote, low voltage and safe near water, operates the rechargeable electric lift motor. 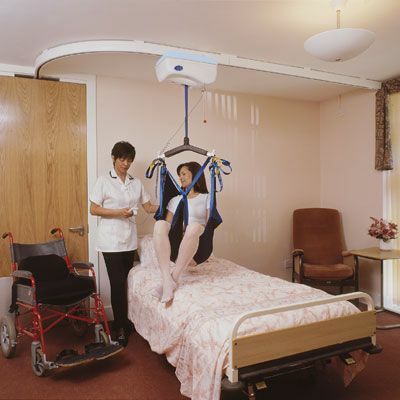 Once the motor has lifted the patient up, the caregiver can easily glide the patient across the overhead beam with the help of the trolley wheels attached to the top of the motor housing. After positioning the patient above the wheelchair, or any other device like a commode, shower chair or comfy chair, the motor safely lowers patient right into place. No worrying about furniture or carpeting getting in the way of a transfer. The caregiver can complete the transfer in as little as five minutes without any strain on their back, shoulders or legs. The Titan 500 freestanding overhead patient lift provides a more comfortable transfer experience for the patient by allowing the caregiver to be close at hand throughout the entire lift. The overhead lift allows for a more dignified process as well. No longer hung out to dry and blowing in the wind. The Titan 500 sits you up and allows you to be gently placed into your chair or bed with ease. 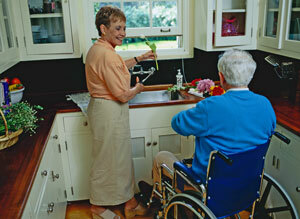 Stay in your home longer with less outside help with the Titan 500 patient lift. Safe, Reliable and Affordable. Find out more about Traxx Mobility Systems and the Titan 500 on our website. You can also find us on Facebook and don’t forget to watch our YouTube channel.